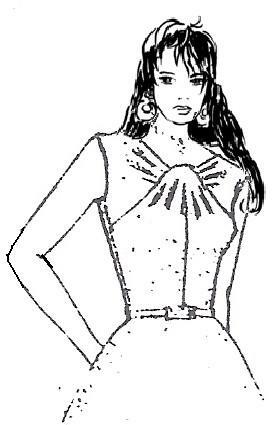 1) Using the dress foundation as in style 1, trace front and back to waistline only; then lower the neckline as shown by dotted lines. 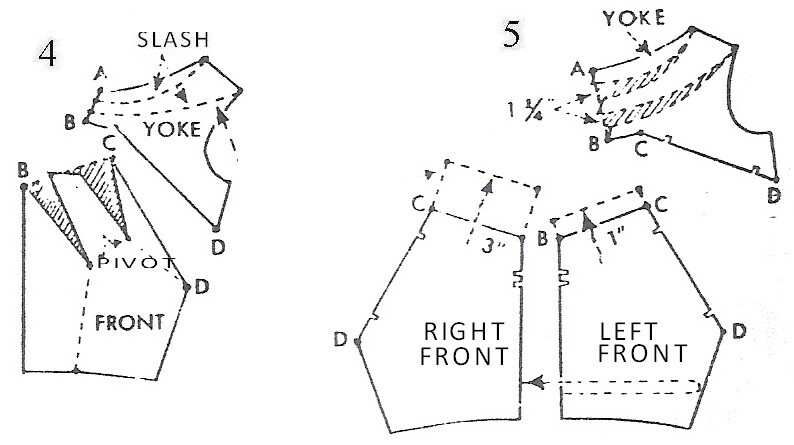 For sleeveless dress bodice, reduce 1/2″ at top of side seam to nothing at waistline; then raise armhole 3/4″ as shown by dotted lines.To keep bodice from standing away at lower part of neckline, reduce 1/4″ at center front and back neckline to nothing at waistline. 2 &3) Draw seam line across front, 1/2″ about square neckline. Separate front and shoulder section at seam; then draw slash lines as follows: First divide seam lines into 3 equal parts; then draw slash lines as shown by dotted lines. 4 and 5) To allow for gathers in front, slash and spread, closing up, the darts; then slash shoulder section and spread to equal the lower spreads. Cut a bias strip 6”x1”x1/4”for loop to cover the gathered seam. To complete the pattern, add seams and make corresponding notches. 1) Using the dress foundation as in style 1. 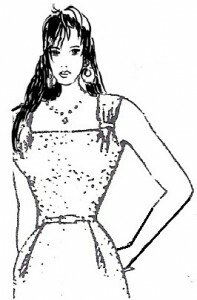 Trace front to waistline only; then lower neckline as shown by dotted lines. 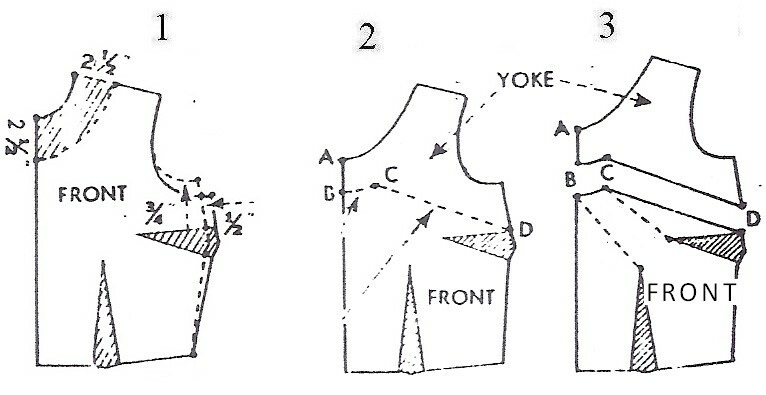 For sleeveless dress bodice, reduce 1/2″ at top of side seam and raise armhole 3/4″ as shown by dotted lines. B to C – 1-3/4”, draw this line parallel to neckline, then connect C to D.
Separate yoke from front; then draw slash lines E and C to darts as shown by dotted lines. 4) To allow for fullness for the front drape, slash along dotted lines and spread. Closing up the darts; then draw slash lines in yoke For gathers in yoke, slash along dotted lines and spread as shown in diagram 5. 5) Trace left and right front sections; then extend right front up 3” and left front up 1” above B and C for loop over yoke at center front as shown by dotted lines.